Biochemistry is the study of all living systems at the molecular level. It looks at the chemical and physical basis of life and how these microcosms interact with their environments. It is a demanding field that combines expertise in Biological Sciences, Chemistry, Physics and Mathematics. Versatility and intense curiosity are the hallmarks of successful Biochemists, as they draw on knowledge from a variety of fields to investigate the molecules that facilitate life. From the structure, function and dynamics of molecular machines, to the complex regulation of metabolic pathways and biological processes, Biochemists study the extraordinary molecules that are produced and utilized by living systems. As a consequence, many of the most spectacular advances in the sciences are often driven by discoveries in Biochemistry. The Biochemistry program will help you develop a strong background in the basic sciences and extensive laboratory skills, while emphasizing the chemical and physical basis of life. As a Biochemistry student, you will gain hands-on experience with the latest tools and technology used in Chemistry, Physics and Biological Sciences, such as molecular biology, protein crystallography and advanced biophysics. You will also develop skills in molecular techniques like DNA sequencing, gene cloning and enzymology. 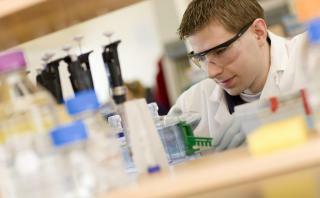 Additionally, you will have access to state-of-the-art science and research facilities. These facilities support the research interests of our award-winning Faculty - your instructors - as they investigate diverse areas such as cancer research, toxicology, crystallography, bioinformatics and molecular modelling, as well as applied research in medicine, disease research and food development.